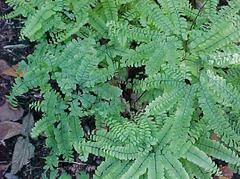 You are at:Home»Herbs»Adiantum capillus-veneris Linn. Latin name : Adiantum capillus-veneris Linn. & Bedd. Description : It has been used from ancient times medicinally, being mentioned by Dioscorides. It is antihyperglycemic, antimicrobial, antirheumatic, antitussive, expectorant, galactagogue, antiviral, astringent, demulcent, depurative, diuretic, emmenagogue, emollient, refrigerant, resolvent, stimulant, sudorific, tonic and vermifuge. Useful in chronic cough, asthma, bronchitis, pleurisy, cold, catarrh, sore throat, nasal catarrh and shortness of breath as well as in all kinds of fevers. It is also effective against jaundice, diarrhoea and spitting of blood. It also provokes urination and menstruation and breaks up stone in the bladder, spleen and kidneys. It is also used as a detoxicant in alcoholism and to expel worms from the body. Also used throughout the world for dandruff and alopecia (hair loss). The plant also has a long standing reputation as an external remedy for giving body and sheen to hair. It checks falling of hair and removes dandruff. It also promotes dark hair colour. Contraindication : This herb has been documented to lower blood sugar levels in animal studies. People with diabetes and people with hypoglycemia should use this plant with caution and monitor their blood sugar levels accordingly. As it stimulates the uterus and promotes menstruation; it is contraindicated in pregnancy. It has shown to have an anti-implantation effect in animal studies and may prevent conception. Couples seeking fertility treatment or pregnancy should not take this herb. Due to its effect on fertility and menstruation, it may have estrogen-like effects and should probably be avoided by women with estrogen-positive cancers.